Italy is a top choice for many when deciding where to go for vacation. If you are planning a visit to Italy this summer, and it is your first time, I’ve put together a few tips that will hopefully help to get you through it all a little easier. A large suitcase can be difficult to cram into a shared transfer or taxi. In Venice for example, it’s likely you will need to walk at least a few blocks to and from your hotel. The sidewalks are narrow and broken, not to mention the many steps you’ll encounter lugging your bag over canal bridges. 2-When ordering your cappuccino or coffee, pay at the register first, and then take your receipt to the counter where drinks are being made. “Caffe Americano” is like American drip coffee. Be prepared to possibly squeeze in between the patrons lining the bar enjoying their beverage. 3-When choosing a restaurant, avoid menus that are printed in several languages. And steer clear of the gentleman trying to lure you into his ristorante. It’ll cost you a lot more than it’s worth. 5-If traveling by train, depending on the train company in which you are traveling, you may need to validate your ticket before you board. A ticket stamp machine is available just before you enter the platform. If the conductor sees that you do not have a validated ticket, you will receive a fine. The fine is about 50 Euro if you can pay with cash on the spot. But pay the fine, always carry ample cash. A fine can be costly if police get involved. Trenitalia I know is one of them. The Leonardo Express running from Rome airport to the Roma Termini station can be tricky too. Make sure your ticket is taking you exactly where you need to go. You can be charged a fine there too. 6-Enjoy the amazing wine, but not too much. Respect the culture and the Italian people. There’s a reason Venezia Italy is run over with tourists. She is a seductress, and we are the marionettes’. A fourteenth century city constructed with Venetian Gothic architecture entices us. Made up of 118 submerged islands, it gives the illusion of a floating city, a stunning city; The “Queen of the Adriatic” as she is appropriately called. Some other fitting titles for this intriguing city are, “City of Water”, “City of Bridges”, or “City of Canals”. The “City of Masks” is another suitable nickname for this ancient lady. Artistic and bright colored Venetian masks are worn during carnival. This traditional event takes place at the beginning of each year. Mass party-goers converge upon Venezia, plugging the maze like paths with the glitter and shine of eccentric costumes; each participant hoping to keep with custom, their identity a bit of a mystery. Venezia is a labyrinth of narrow walled footpaths. Getting lost is a guarantee. You followed the map closely; certain each turn was the right one. But, here you are, retracing your steps searching for the exact spot where you were misled. Considering there are 400 footbridges and 177 canals, it’s easy to get confused. 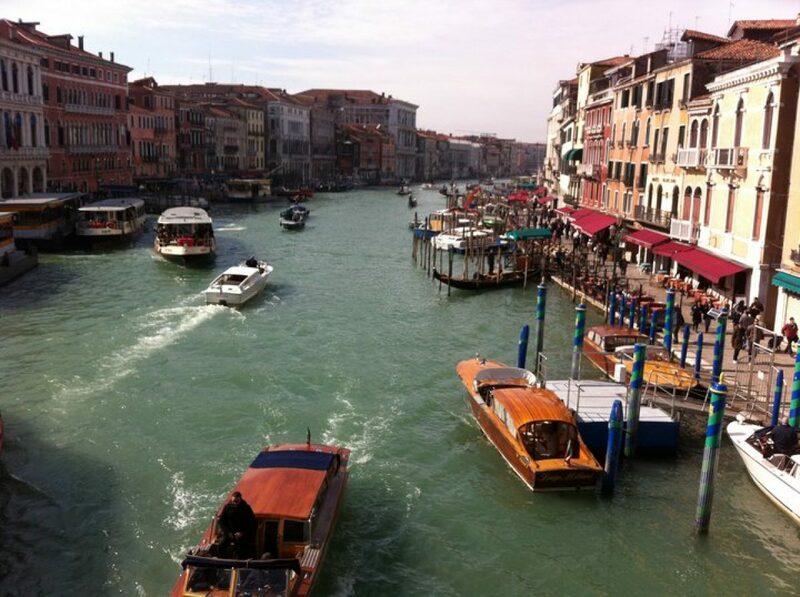 Traffic on the Grand Canal is busy and fascinating. Small mail delivery boats are laden with packages, and they swiftly cruise by water buses and taxis. Hotel and restaurant supplies are transported the same way, urgently! It’s a different experience for a gondolier. The glide of his gondola is smooth and silent upon the water. He may sing to his riders. But he’ll most likely be more boisterous when he and another’s gondola come together in a slender canal! Cathedrals and palaces can be seen all over Europe. I think its Venezia’s unique character that summons us.